I was recently contacted by the National Army Museum to consult and treat a fluid preserved specimen that is due to be displayed in their newly renovated museum. 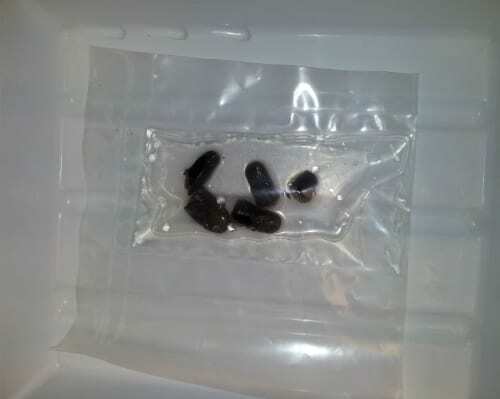 The specimen is the frostbitten, severed fingertips from Major Michael Patrick ‘Bronco’ Lane. Bronco Lane summitted Mount Everest in 1976, but during this expedition, ran into bad weather and was forced to remove his glove to attach an oxygen bottle to his face mask. An hour after he removed his glove, he found his hand had frozen. The fingertips were removed on his return to the UK. 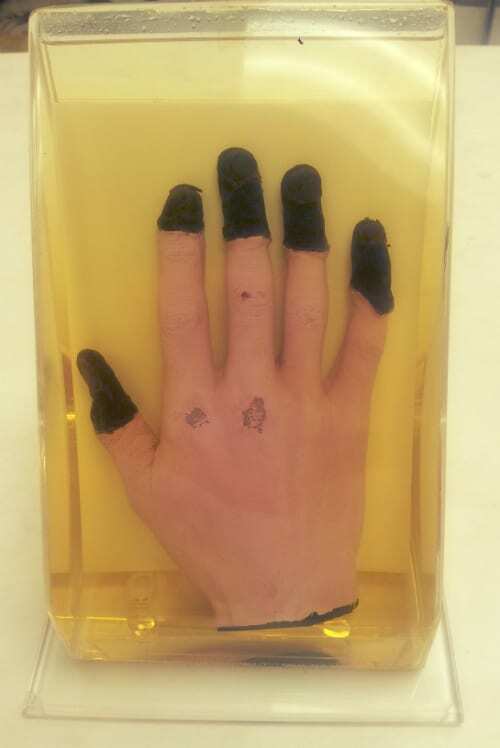 The main issue with the condition of Bronco’s fingers was the unsightly peeling of the paint on the wax hand. 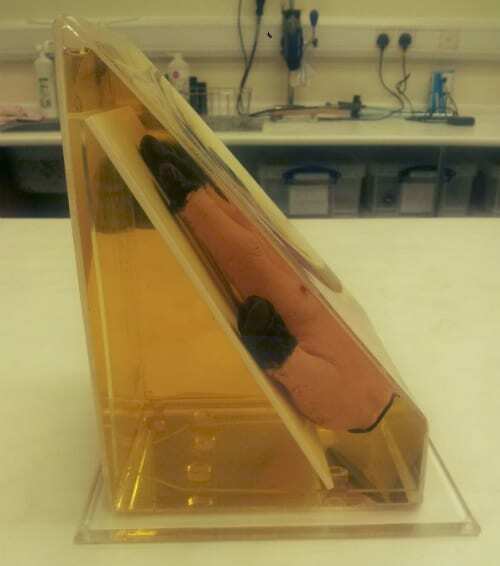 Additionally, the very presence of the wax model of Bronco’s hand was quite an unusual mounting technique for fluid preserved human tissue and could misrepresent what constitutes the actual specimen. In addition, the acrylic pot that contained the fingertips was significantly larger than it needed to be, thus making the specimen heavier and more cumbersome to handle. 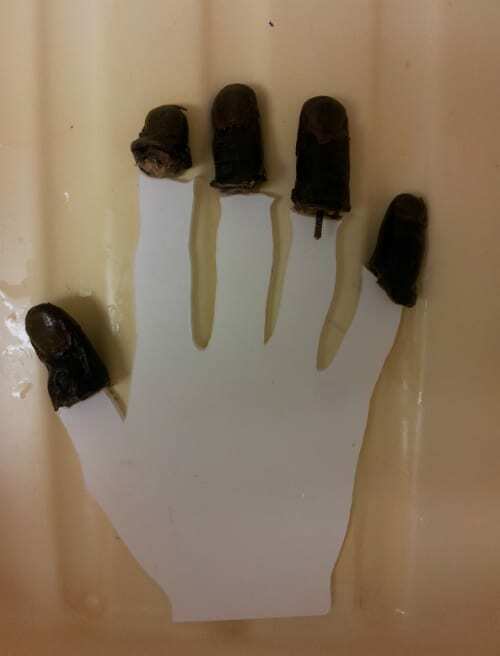 The decision was made to remove the fingertips from the current wax hand mount and to experiment with alternative mounting techniques. Fingertips removed from the wax hand mount and sealed in a polythene bag. 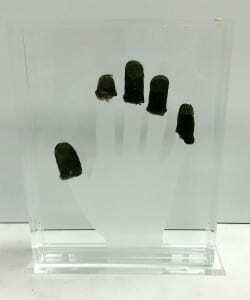 The curators at the National Army Museum wanted any new mount to retain the image or perception of a hand as they thought the fingertips would be hard for visitors to interpret if they were mounted in a pot by themselves. 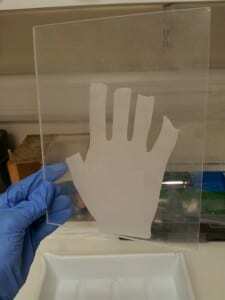 The first mounting option I experimented with was to create a cut-out acrylic shape of the hand, which I would be able to secure inside the acrylic pot. The extreme detail in the wax hand, along with the perfect fit to the severed fingertips lead me to believe that the wax hand was made from a mold of Bronco’s actual hand. I therefore wanted to retain this level of accuracy and positioning to the fingertips so I used Adobe Illustrator to trace an exact outline of the wax hand in order to make a laser cut shape for the mount. First attempt at making a 3D laser cut mount for the fingertips. The first attempt was pretty successful and it produced a nice 3D laser cut acrylic shape of the wax hand. It became clear that it would be a challenge to how I would then attach the acrylic hand shape inside the pot, along with then attaching the fingertips to a backboard. When investigating the features of the laser cutter, the engraving function seemed like it might have some promising results for this project. I decided that I could engrave the hand shape directly onto the backboard of the pot, thus removing a 3D mount completely from the pot. This mounting method is similar to the typical mounting techniques of traditional fluid preserved anatomy and pathology specimens, however it has allowed me to represent missing or lost sections of the anatomy so that the viewer has a better idea of what they are looking at. And it does away with the slightly gruesome, peeling, wax hand in the original pot – an overall win!